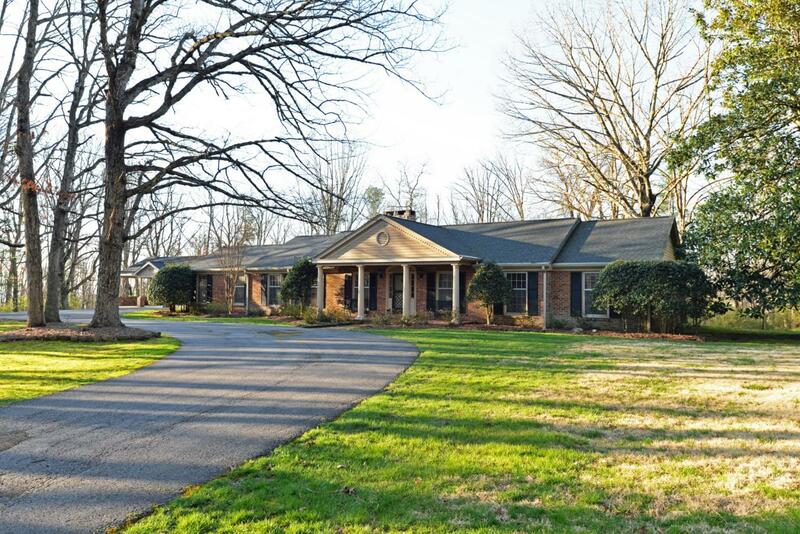 TRULY UNIQUE OPPORTUNITY TO OWN 6.58+/- PARTIALLY WOODED AND PRIVATE ACRES IN THE HEART OF LOOKOUT MOUNTAIN JUST MINUTES FROM SCHOOLS AND DOWNTOWN CHATTANOOGA. Hard to find, 5 bedroom, 4 full bath home, all on one level with so many wonderful updates - especially the new kitchen and great room that are now open to one another and seem all the more spacious due to the addition of the glass folding doors to an enormous screened in porch with an outdoor gas fireplace with a raised hearth and stone surround, as well as access to one of 2 rear decks, effectively inviting the outdoors in and providing a wonderful flow for entertaining. It also makes a cozy spot to curl up with your morning coffee or keep an eye on the kids or pets while they romp and play in the fenced back yard. Enjoy thefeeling of coming home and mentally leaving your cares behind as you enter the tree lined drive to your mountain retreat. The tour of the inside begins with the original foyer, the formal living room with fireplace, and the dining room which has access to the new kitchen that boasts granite counter tops and tile back splash, a center island, Thermador double oven with 6 burner gas cook top, griddle, and warming drawer, Thermador built-in refrigerator, Thermador dishwasher, access to the walk-in pantry in the laundry room and is open to the aforementioned great room with another beautiful gas fireplace with stone surround. A convenient refreshment center is accessible by both rooms and boasts a wet bar, below-counter microwave and drink fridge. There is a family/rec room on the other side of the kitchen that has handsome wood paneling, beamed ceiling, brick flooring, a built in bay window seat with storage, as well as access to the rear hall with a full guest bath, a bedroom, mud/storage room, workshop with 2nd rear deck and the 3 bay carport. Just off of the great room, you will find a lovely office or sunroom that leads to the master suite with brand new hardwood floor in the bedroom, a master bath with "L" shaped vanity, jetted tub, separate shower and 3 walk-in closets. Two additional bedrooms are adjoined by a Jack and Jill bath with separate vanities and share a walk-through shower and water closet, while the 5th bedroom has a private bath with air jetted tub/shower combo. Some extra details include hardwood, tile and brick flooring throughout, decorative lighting, plenty of natural lighting due to the abundance of windows in every room, storage galore, 2 different fenced areas in the back yard, a backboard for fun and games and so much more. Definitely a must see if you are looking for a spacious home in a private setting that only an acreage property can provide. All of this, and it is only 15 minutes to downtown Chattanooga, so please call for additional information and to schedule a private showing today. Information is deemed reliable but is not guaranteed. Buyer to verify any and all information they find important.